“I’ve talked to my lawyers,” President Obama said in explaining his dismissal of the argument that Section Four of the Fourteenth Amendment authorizes him to raise the debt ceiling if Congress fails to act. “They are not persuaded that that is a winning argument.” But who are President Obama’s cowering lawyers, and why would the former constitutional law professor defer to their overly cautious prediction that the Supreme Court would rule against Obama if asked to adjudicate a dispute between the president and Congress? In fact, it’s far more likely that the Court would refuse to hear the case. And even if the justices did agree to hear it, the conservative justices would be torn between their dislike of Obama and their commitment to expanding executive power at all costs. If all the justices are true to their constitutional philosophies, the Court would rule for Obama by a lopsided margin. In addition to their concerns about legal standing, the conservative justices have also, in other cases, said that the courts should refuse to hear cases that raise “political questions”—in other words, cases that raise the possibility of “embarrassment from multifarious pronouncements” by the president, Congress, and the Supreme Court on the same legal issue. Nevertheless, Bush v. Gore showed that the conservative justices can abandon their longstanding devotion to construing standing requirements narrowly and the “political question” doctrine broadly when their political passions are high. So let’s imagine, for the sake of argument, that the Roberts Court agreed to hear the case of Obama v. Boehner and decide it on the merits. How would the justices rule? 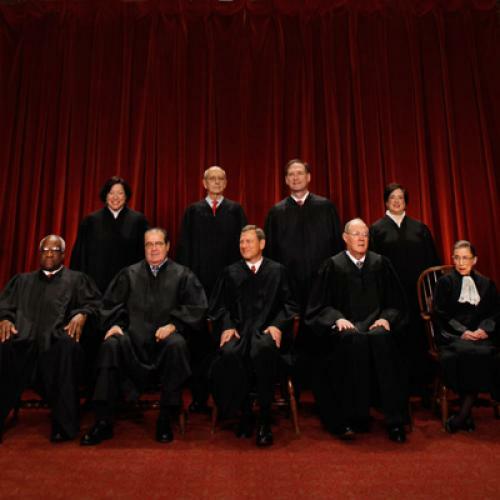 It seems a safe bet that all four liberal justices would rule for Obama. There’s a strong argument that Congress’s refusal to raise the debt ceiling falls within the spirit, if not the letter, of the paradigm case that the framers of the Fourteenth Amendment were concerned about: the efforts of former Southern rebels who had been newly elected to Congress effectively to overthrow the government by repudiating the Union debt and assuming the Southern debt. All four liberal Justices are committed to a vision of “living constitutionalism” that interprets the historical evidence broadly, and they would be supported in their judgment by the Perry decision. Moreover, at least two of the liberal justices—Elena Kagan and Stephen Breyer—have supported broad judicial deference to the president’s ability to control the administrative state through regulations and unilateral action. And none of the liberals on the Court tends to be overly textualist when construing Congress’s power. What about the conservative justices? Here the divisions in the conservative ranks might become relevant. There are three distinct strains of legal conservatives on the Court: the tea party conservative, Clarence Thomas, the libertarian conservative, Anthony Kennedy, and the pro-executive power conservatives, John Roberts, Samuel Alito, and Antonin Scalia. Of these five justices, Thomas is the only one whose judicial philosophy might lead him to side with Congress over Obama. As someone who believes that Congressional power over the purse should be construed strictly, Thomas might conclude that Article I gives Congress, and not the president, the power “to borrow money on the credit of the United States”—a power that it has exercised by establishing a debt ceiling. The debt ceiling doesn’t repudiate the debt or question its validity, Thomas might hold; it simply threatens default by prohibiting the president from assuming extra debt beyond what Congress has authorized. According to this argument, Obama’s unilateral decision to take on additional debt to avoid a government default would not represent debt “authorized by law,” as the Fourteenth Amendment requires, and therefore wouldn’t be justified by the Amendment. On the other hand, Roberts, Alito, and Scalia, if they remain true to their judicial philosophies, should reject this argument and rule for Obama, not Congress. All three have devoted their careers to defending a broad vision of executive power, and they might even embrace the argument that Obama doesn’t need to rely on the Fourteenth Amendment; instead, he can raise the debt ceiling on his own, by invoking what Eric Posner and Adrian Vermeule have called “his paramount duty to ward off serious threats to the constitutional and economic system.” In addition, the nationalistic instincts of the three pro-executive justices have led them to be consistently sympathetic to business interests, who in this case might support any presidential action that avoids default. Where does that leave the libertarian justice, Anthony Kennedy? He has no hesitation about the idea that courts—by which he means himself—should adjudicate battles between the president and Congress, and although he is all over the map on the issue, he tends to side with Congress rather than the president when forced to choose. This is what happened, at least, in cases involving Bush’s attempt to set up military commissions at Guantanamo without Congressional approval, for example, or in cases involving the Bush Environmental Protection Agency’s refusal to regulate greenhouse gas despite a Congressional law to the contrary. Still, Kennedy views himself as a responsible actor whose duty is to prevent economic and political chaos, as Bush v. Gore showed. In the spirit of caution, let’s chalk him up as a tentative vote for Congress over Obama. All this suggests that if the justices are true to their judicial philosophies, either they wouldn’t hear the case of Obama v. Boehner or, if they did, at least seven justices would vote for Obama. If, by contrast, the justices ignore their judicial philosophies and vote on party lines, Obama could lose 5-4. But the possibility of a lopsided victory should certainly embolden a constitutionally confident president to ignore the cramped advice of his lawyers and to throw down the gauntlet. As Bill Clinton, another former professor of constitutional law, recently declared, if he were president, he would invoke the Fourteenth Amendment to raise the debt ceiling “without hesitation, and force the courts to stop me.” There’s a good chance they wouldn’t.